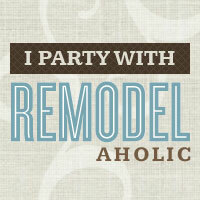 We have been in our house for 4 years now...and would you like to know the first thing I did on my own to the house (not including tearing down a wall)? 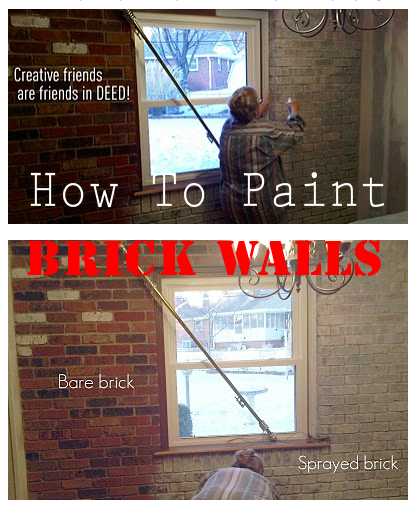 I painted the red brick wall that was a total eyesore to me! I was scared when I did this because it is not a "reversible" process. Once it's done, that's it. You're stuck with painted brick. So, luckily I didn't have to go into this alone...I have a friend who has many cool tricks up her sleeve (wish she had a blog!) and she shared this one with me. Use a cheap spray bottle you can find at any hardware store. Use paint you already have. Mix it with water. Those are the rules. 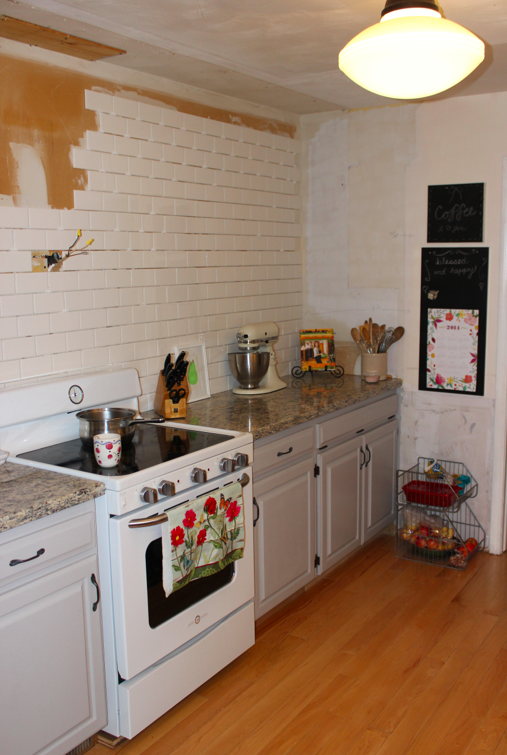 Luckily I had purchased several gallons of a beautiful cream colored paint (BEHR - Cottage Stone in Semi-Gloss Latex), and when my friend was visiting, she said "Let's paint that brick!" I was a bit nervous what my husband would say, since men don't like painted wood or bricks very much. He is learning quickly that I paint it ALL! 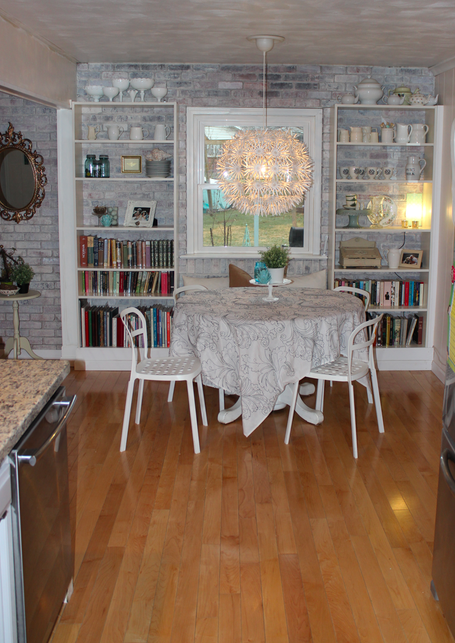 Read More....read through to the end and get a sneak peek at my latest kitchen project. 1. In an empty gallon milk jug, pour 1/4 paint to 3/4 water. Shake well till mixed thoroughly. Will look like milk! 2. Then, using a funnel (or not) pour carefully into a spray bottle. I got the spray bottles from Lowes in the cleaning section for about $3, sort of the industrial kind. Some of them work great and some stop working right away, so you may want to buy more than one. 3. If your brick is clean you can start. If not, make sure it is dust and cobweb free. 4. Prep - Cover your floors with waterproof tarps. Have lots of paper towels on hand. You can either cover your windows with plastic or just be ready to clean up the paint drips immediately after spraying. 5. Now you're ready to start spraying your bricks! There's a technique to it...swoosh your wrist across the area you are painting at the same time as pulling the trigger on the sprayer. You are trying to get an even coat of thin paint. With this method you will still have some color variations showing through and it won't be completely "white". It brightens the brick. You can even do more coats if you want it to be brighter and whiter. I totally suggest painting boring red brick if it's on the interior of your home. It's quick and easy and you'll love how bright it is. 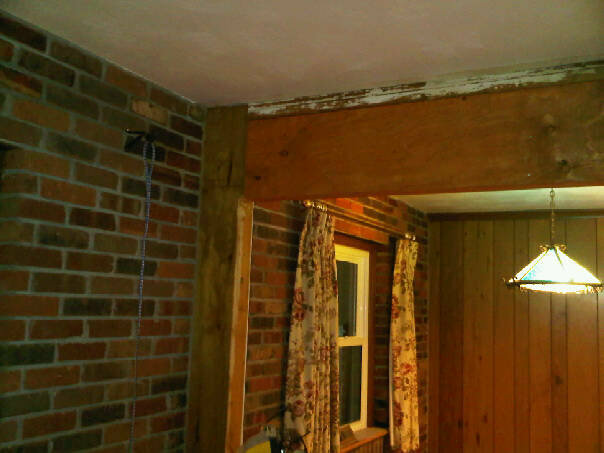 After I finished the fireplace and painting the paneling I almost feel like it's light in there! The friend who helped me with this has also painted the exterior of her home's chimney which is made of stone...her neighbors were jealous! NOTE: I used latex semi-gloss indoor paint for this project (Behr), but exterior works too. You may also use this for outdoor brick or stone re-facing. It really works! The paint effect has not faded or chipped in the past four years since I did it. Seriously! Wow, it looks fabulous! I've always loved the look of white painted brick. 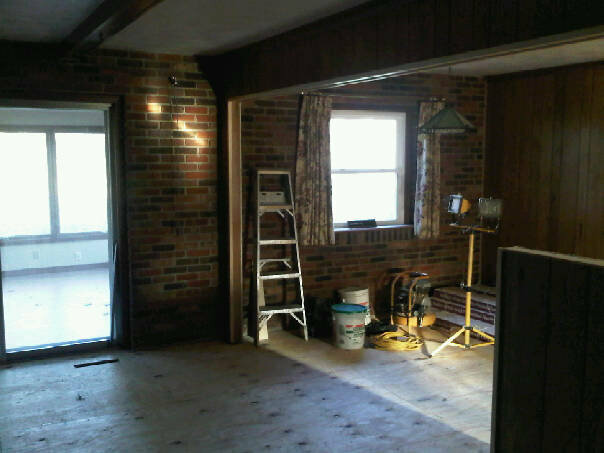 We have a huge brick hearth that I'd love to paint but I know my husband would be horrified! Thanks for the tips. The results are really good! I really like how the room looks now. Looking forward to your kitchen remodel post! Genius, beautiful and creative! I've been painting since I was old enough to paint. My mother's first husband was a painter and she always says that it's funny I'm not his daughter, because I paint like a painter. I'll remember this for in the future. Nifty idea and it sure made a difference. But I bet your hand got tired.